Mary Weick-Brady brings us another recipe, following on her earlier recipes for hot chocolate and use of parsley. 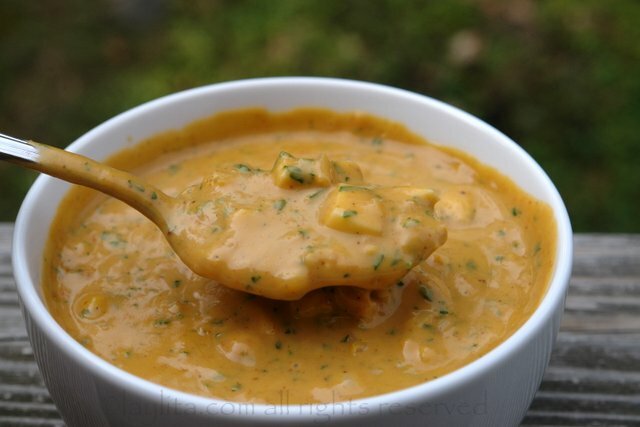 Who did not have peanut sauce when they lived in Ecuador? Here’s a great recipe for that peanut sauce that will bring back many memories. 1. En una olla ponga el aceite, achiote, cebolla, culantro, el aji (entero), sal, comino, y pimienta. Haga un refrito, ponga el librillo picado. 2. Agregue el mani y la leche, haga hervir 20 minutos. 3. Retire del fuego y agregue el huevo picado. 4. Come a su gusto! 1. in a bowl, put the oil, achiote, onion, cilantro, garlic, salt, cumin, and pepper. Mix thoroughly. 2. Mix in the peanuts and milk and cook for 20 minutes. 3. Remove from the heat and mix in the minced eggs. 4. Enjoy however you’d like! We are Friends of Ecuador (FoE). Anyone who has an interest in supporting grassroots development in Ecuador — e.g. Ecuadorians, North Americans, parents, Volunteers, travelers, and students — is eligible to join. Started by returned Volunteers who served in the Peace Corps, FoE is dedicated to linking all friends of Ecuador to each other and to the country and its people. As of March 18, 2004 FoE is a 501c3 non-profit, eligible to receive tax-deductible donations. By supporting Friends of Ecuador, you are supporting both an alumni network of returned Peace Corps volunteers but also connections between the RPCV community and current volunteers in Ecuador. We also have an opportunity to support volunteer projecs through Peace Corps Partnerships.